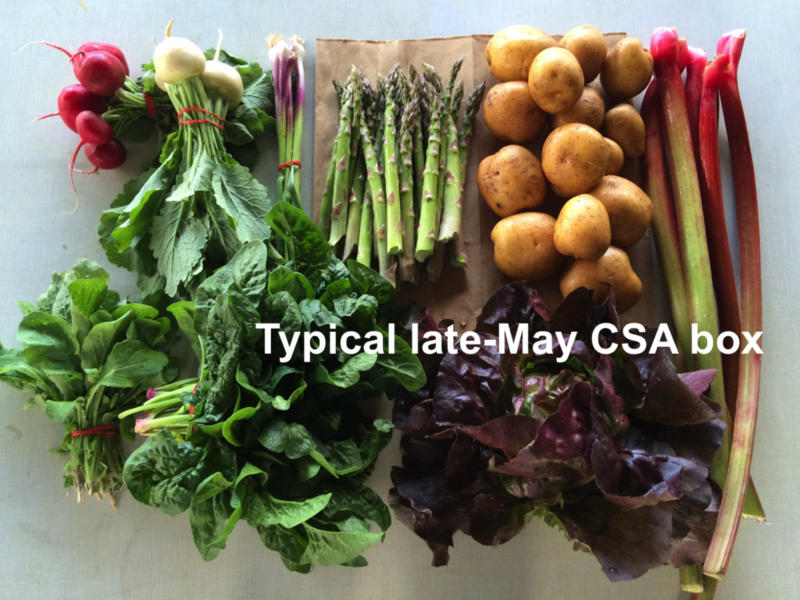 We offer two shares to extend the CSA season into November, for hungry members who want to continue their local-foods adventure. Both shares focus on fall vegetables, roots, winter squash, etc. Go here to learn more and view sample boxes from previous years. Beth’s box logic: – Wow, look at all the cabbage family vegetables in this box (cauliflower, broccoli, Koji or tatsoi greens). That’s what happens in fall. Stock up on your anti-oxidants this week. – Roast your three poblano peppers. This is easiest on a grill. Peel the roasted chiles, cut into strips and use to top any dish this week. Great with any version of potatoes, or sprinkled into soup, or over top of casseroles, or cooked into scrambled eggs. We stir strips of roasted poblanos into tomato-pepper soup at the end of cooking. – See below for a recipe to wilt your raw Koji greens. It’s a great technique to manage large heads of Asian greens. Next week’s box will probably contain sweet potatoes, cauliflower or broccoli, cabbage, peppers, red onion and more. Cauliflower – Woohoo! The cauliflower is ready and the heads are beautiful. Koji greens (large head of dark green leaves) – Similar to other Asian greens like tatsoi or Yukina. We did not expect this to be ready until mid-October but it’s ready now. Cool weather in August was ideal for the young plants to get going. The recent hot spell sped them to maturity. These are really, really great. Consider trying my Wilted Choy Salad (below) if you are intimidated by large heads of Asian greens. Red potatoes – These red potatoes are from our friends at Driftless Organics in western Wisconsin. This is a fresh batch of the red potato variety we got from them a few weeks ago. I found those to be excellent and more broadly useful than red potatoes often are. They were successful in potato salad yet they also roasted beautifully as oven fries. Slicing tomatoes – These might be the final ripe tomatoes of the year. By this time of year, we recognize that tomatoes do not store well. Use them quickly; don’t try to hold them. Poblano chiles (triangular, shiny, green or red) – These are mildly hot. Poblanos are the creme de la creme of chiles. They have lots of great flavor in combination with manageable heat. Roast and add to soup or casseroles. For our household, they are emblematic of fall cooking. Garlic – This garlic is from John Hendrickson of Stone Circle Farm. Pepper ID. Top left, poblano chiles (mild heat, triangular in shape, green or red). Top right, Orano pepper (sweet, orange). Bottom, bell peppers (sweet, red or green). Koji and tatsoi are similar Asian greens. Eat both the leaves and stems. Large heads of bok choy or Koji greens can be intimidating. This technique shrinks raw greens without cooking, while preserving their peppery flavor. It’s a useful approach with bok or pak choy, Yukina, tatsoi or Koji greens. I’ve provided a dressing suggestion, but you can use any dressing you like, even bottled. 1. Slice Asian green leaves and stems into 1/2 inch strips. Wash well in a basin of water. Drain in a colander. 2. Set the colander in a bowl or in the sink. Sprinkle 1 1/2 Tbsp salt over the greens and mix with your hands. This large amount of salt will be washed away later. 3. Wait 30 – 45 minutes. The salt will wilt the greens. 4. Rinse greens under running water, then dump into a fresh basin of cold water. Swish and drain, then repeat. Taste the greens. They will be slightly salty. 5. Squeeze most of the liquid from the greens. (Leave more liquid for thin-stemmed greens like Koji or tatsoi. Thick-stemmed bok choy will continue to release moisture after you assemble the salad.) In a large bowl, mix with the carrots and peppers. Dress with your favorite dressing. Mix all dressing ingredients except the sesame seeds together in a small bowl. Dollop over the salad and massage together with your hands. Adjust the vinegar and soy sauce to taste. Sprinkle with toasted sesame seeds and serve. This is one of my favorite dinner party meals. It feeds a crowd. It’s simple to make (especially if you have a food processor). It warms up well and incorporates loads of fresh veggies. If I were you, I’d make a pile of roasted broccoli and serve that on the side along with some sliced tomato. Lauren. In a small saucepan, combine all tomato glaze ingredients. Whisk together as best you can and then bring to a boil. Reduce to a simmer and let cook while you prepare everything else (about 45 minutes-1 hour), whisking occasionally to prevent it from sticking. You want the sauce to reduce to less than half its original amount and a consistency a little thinner than ketchup. In a large saute pan, melt butter for mashed potatoes. Continue cooking over medium heat until it begins to sizzle and then brown. It should smell nutty but not burnt. Use a spatula to remove all the delicious buttery bits from the pan to a small bowl. Preheat oven to 400 degrees and find two 9×13 baking pans. Next, begin to prepare your meatloaf. Tear bread into pieces and toss in a food processor. Process until it turns into crumbs. Remove to a large bowl. It’s fine if a few crumbs remain. Add carrots, onion, pepper and garlic to the food processor and process until finely chopped. In the same saute pan you browned the butter in, heat olive oil for meatloaf over medium heat until hot. Add chopped veggies and sprinkle with 1/2 teaspoon salt and pepper. Cook for 10 minutes until just starting to char in places. Add to bowl with breadcrumbs along with eggs, Worcestershire, Dijon, paprika and remaining 1 teaspoon of salt. Let the meatloaf mixture sit while you begin your potatoes. Add potatoes to a large stock pot, cover with water and bring to a boil. Once boiling, reduce to a simmer and cook for 25 minutes. Now, shape your meatloaves. You will want 12 small loaves total, six in each baking pan. Place in the oven. Bake for 10 minutes then remove and top with reduced tomato glaze. As much as you can get to stay on. Anything leftover can be served with the meal. Bake loaves an additional 10-15 minutes until brown on the edges and cooked through. Drain your potatoes. Return to the pot and mash as best you can. Add browned butter, milk and salt and mash until smooth. Serve potatoes with meatloaves on top. Throw some roasted and charred broccoli and/or sliced tomato on the side. Make sure to add any additional leftover tomato glaze to the loaves. Using the large holes of a cheese grater (what you’d use to shred cheese), shred cauliflower into small pieces that resemble rice. Change the angle of the cauliflower so you get all the florets but not much of the stems. Set “rice” on a towel to remove excess moisture. Prepare your onion. Peel and halve it. Thinly slice half of the onion. Cut the remaining half in half again and thinly slice one of these quarters. Finely chop the other quarter and put both onion preparations to the side. In a large saute or sauce pan (that has a tight-fitting lid), heat 1 tablespoon olive oil over medium low heat. Add garlic and half of the diced onion. Sprinkle with 1/4 teaspoon salt. Cook gently until veggies become fragrant, about 3 minutes. Add the cauliflower rice and put the lid on. Cook for four minutes then remove to a medium bowl. Add half the lime juice, 1/2 teaspoon chili powder, 1/2 teaspoon cumin and 1/4 teaspoon dried oregano to cauliflower rice. Taste and adjust seasonings. Set aside. In the same pan you used for the cauliflower, add the remaining tablespoon of olive oil and heat over medium heat. Add the sliced onions, red peppers and poblano peppers and cook for 8-10 minutes until softened and even charred in places. Add 1/2 teaspoon salt, 1/2 teaspoon chili powder and cayenne pepper. While this cooks, combine black beans with remaining salt, chili powder and cumin in a small saucepan. Cook over medium low heat until warm. Serve in bowls with cauliflower rice on the bottle and all desired toppings. I love the beans and peppers with diced tomatoes, guacamole, sour cream and hot sauce. Place avocados in a medium bowl. Mash with a fork. Add remaining ingredients and stir to combine. Taste and adjust seasonings as desired. The tomatoes are still going strong. We can thank the dry weather for that. At top, Kerry and Kelsie wash plum tomatoes. The improved light in our new shed is wonderful. We’ve enjoyed it all season. Charlotte and Maggie bundle dill for the CSA boxes. Small scale, big scale. Smitty, Billy, Matt, Jim, Jose, Raul and Kelsie bundle golden beets with the greens attached. We do this task by hand. Really, it’s the only way to do a quality job. In a nearby field, Steve harvested carrots mechanically. With our root digger, we can harvest 1000 lb carrots in 30 minutes with just three people. Without this sort of tool we couldn’t grow enough carrots to feed you all winter. From left, TipTop acorn, Carnival acorn, Jester (an acorn x sweet dumpling hybrid), Honey Boat delicata (2/box). We harvested a variety of early maturing types for this week’s box. You will receive one of these types. Some are new-ish varieties for us. We trial new varieties for a few years before scaling up and each of these types made the cut. I think these are all winners but I’d like to hear what you think of them. There’s a limit to how many I can sample! Expected life: These acorn and delicata types do not store for long. Plan to eat within two weeks. Storage: Store at room temperature, uncovered. To make squash easier to cut: Microwave on high for 30 to 60 seconds, depending on size of the squash. This will soften the rind and flesh, making it much easier to cut. Beth’s favorite simple preparation: Winter squash are easily roasted in a 400F oven. Microwave your squash to soften it. Split in half with a sharp knife. Scoop out and discard seeds. Run the squash under running water and shake off the excess water. Place cavity-side-down on an oiled baking sheet. The little bit of moisture helps seal the squash to your roasting pan. The water soon evaporates, allowing the squash to brown and caramelize. The caramelization really boosts the flavor. Roast at 400F until easily pierced with a fork, 20 – 45 minutes depending on size. Flip over while hot. Add a little butter to melt and some seasoned salt. Cut into wedges and eat. Can you eat the rind? Well, Steve eats the rind for all these types but he’s a little crazy. In my opinion, the rinds are too thick to eat on the acorn types (TipTop, Jester, Carnival). Delicata skin is usually thin enough to eat but this durable Honey Boat variety has a somewhat thicker rind than usual. I don’t eat it; Steve does. Stuffed squash: Each of this week’s types has a central cavity that can be stuffed. Prepare your favorite fully-cooked stuffing, e.g. a rice or quinoa mixture. Roast your squash as described above. Preheat the stuffing. Fill the cooked squash with stuffing, top with grated cheese and return to the oven until everything is hot. – Your dill will be a bundle of both flowers and leaves. Use the flowers to make a dilly-bean salad or some refrigerator dilly-beans, similar to refrigerator pickles. – Dill leaves combine well with broccoli, so think about an egg-broccoli-dill dish, along the lines of a quiche or frittata. – Cream of tomato soup with dill is really, really good. Use your favorite tomato-basil soup but substitute dill for the basil, and reduce the amount. Use a light hand with the dill if you’re planning to save soup for leftovers. Dill tends to strengthen over time in tomato soup. A few sites get an heirloom tomato or a cucumber or some extra beans. Next week’s box will probably contain broccoli, potatoes, tomatoes, peppers, spinach and more. Golden beets with greens – Beet greens are tasty, similar to Swiss chard in flavor, texture & cooking time. These two crops are very closely related. You can remove the thickest midribs before cooking if you wish, but it is not essential. Storage: Cover and refrigerate. Separate the tops and roots if you don’t plan to eat the greens immediately, to preserve freshness in the roots. Beet greens are perishable and should be eaten soon. The beet roots will last for weeks. Broccoli – 2017 continues to be a good broccoli year. Broccoli needs a lot of water at its adolescent stage and this planting certainly got it this summer. Yellow onion – This week’s onion is an intermediate type which will fry successfully yet is not as pungent as a typical yellow storage onion. Dill – You’ll get a bundle with both flowers and leaves. Ideas: See above. Winter squash – See above. Beth’s notes: This box is loaded with solanaceous crops (tomatoes, potatoes, eggplant, peppers, chiles). This is an excellent week to make ratatouille. Remember, Pat gave us a recipe for Ratatouille Provencal earlier this season. Pat and Lauren’s recipes are always appealing but they have come up with an unusually appetizing set this week. A few sites get one heirloom tomato per box. Next week’s box will probably contain tomatoes, peppers, leeks, lettuce, beans, some kind of green and more. Red potatoes – These Red Norland potatoes are from our friends at Driftless Organics. Yellow onion – This week’s onion is an intermediate type. They are not very pungent but not as mild as a Walla Walla. They are fairly moist but you can brown them successfully. Heirloom tomatoes (ONLY AT SOME SITES; a large tomato that’s not in the paper bag with the other tomatoes) – We will rotate heirloom tomatoes among the sites as they ripen. Heirloom tomatoes are full-flavored but delicate. If you receive one this week, please handle it very gently, as these fragile beauties bruise easily. Some are delivered ripe, some need to ripen at room temperature for a day or two. Plan to eat your heirloom as soon as it is ripe. FYI, we did not wash the heirlooms this week, in an effort to minimize handling and bruising. Just give it a gentle wash when you are ready to eat it. The only slender green or red peppers in your box this are spicy Anaheims. Slender orange peppers are sweet Oranos. Bell peppers this week are blocky and could be green, red, yellow, orange or purple. Everyone gets two sweet peppers this week (or three if they are small). Everyone also gets one Anaheim. Cook your quinoa (or grain of your choice). I always follow these directions for perfect results.†Once cooked, add diced peppers and set to the side. On a large baking sheet, drizzle with 1 tablespoon olive oil. Add zucchini and onion to pan and sprinkle generously with salt and pepper. Bake for 15 minutes. Move veggies to one side of the pan and add sliced tomatoes to the other. Season with salt and pepper. Roast 25 more minutes. At this point, veggies should begin to look charred. If not, turn on the broiler and cook 5-10 more minutes. Meanwhile, while the veggies cook, heat remaining olive oil in a large saute pan over medium high heat. Add chickpeas and 1/2 teaspoon Kosher salt. Cook for 15 minutes until chickpeas are golden brown and crispy. Remove to paper towel to drain grease and then toss with paprika. Prepare the dressing by combining all ingredients in a small bowl and whisking until smooth. To serve, scoop quinoa into large bowls. Top with roasted veggies and drizzle with dressing. Add crispy chickpeas just before serving. Begin with the dressing. In a large, heavy saucepan (use a cast-iron skillet if you have it!) heat olive oil over medium high heat. Add onion and saute gently for 5-7 minutes for until the onions begin to be charred (and smell almost burnt). Sprinkle generously with Kosher salt and remove from heat. In a small bowl, combine yogurt with vinegar, honey, mustard and garlic. Whisk until smooth then add sauteed onion. Stir in olive oil and set aside to marinate. In the same large pan you cooked the onions in, heat two tablespoons olive oil over medium high heat. Add half the eggplant in a single layer and sprinkle with salt. Cook for 3-4 minutes without moving until browned. Use tongs to flip and cook 2 minutes longer. Remove to a large bowl. Add remaining olive oil to pan and repeat browning with remaining eggplant. **If you aren’t planning to eat all the salad in this one sitting, place as much avocado as you plan to use on a platter and top with proportionate amounts of salad. Drizzle with dressing.